BlackBerry 10.2.1 is here, but can it breathe new life into the fruity phones? BlackBerry's smartphone business may be dying a slow death. but the Canadian company isn't ready to bow out just yet. It's continuing to support customers with a new software update, bringing the BlackBerry 10 OS up to version 10.2.1. 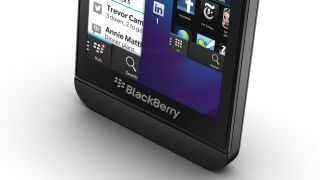 The update is rolling out to customers around the world starting today and it brings a treasure trove of features and improvements to BlackBerry's beleaguered OS. The new features include a 'picture password', which allows you to quickly unlock your handset by dragging the correct number over the correct part of an image. There's also a new device and battery monitor, which provides CPU stats as well as information on battery life and storage. If you have a BlackBerry Z30, Q10 or Q5 and have been longing for an FM radio you're in luck, because the update adds one for those handsets, allowing you to listen to local stations without an internet connection. On the improvements front BlackBerry 10.2.1 allows you to swipe left to answer a call or right to ignore it, as well as adding new intuitive icons to the incoming call screen, making it easy to silence a call or message the caller. You can also create SMS and email groups, open lock screen messages with a tap, pinch the BlackBerry Hub to filter messages, customise the available actions on the Quick Settings menu, save web pages for offline reading, choose which sources to sync a contact from, receive automatic software updates and if you have BES 10.2 you'll also gain extra security features and IT policies. It's an impressive update for such a minor number jump and while it won't likely be enough to win many new customers it should at least keep existing ones happy. Not only is BlackBerry supporting its existing devices, it's also working on some new ones.